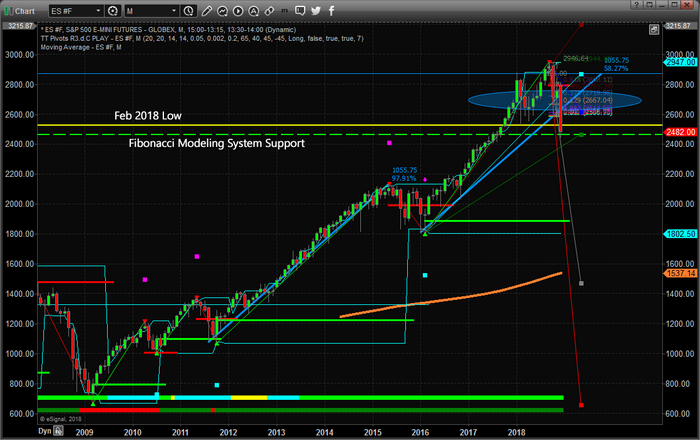 S&P Breaks 2018 Feb Lows – What Next? – Technical Traders Ltd.
S&P Breaks 2018 Feb Lows – What Next? The ES (S&P e-mini contracts) broke the support level from the February 2018 lows immediately after the US Federal Reserve announced a 25 bp rate hike this week. This breakdown below the February 2018 lows is concerning because it indicates that previous support is not holding and we could be in for further downside price activity. We are preparing a detailed research post for early next week regarding a broad range of US markets as well as how our proprietary price modeling systems are reflecting this recent price move. What we can suggest to all investors is play small positions at the moment and prepare for increased volatility. There is near-term support that may come into play soon, but overall the markets are reacting to a deleveraging event that could see prices push below 2400 before finding true support. Visit www.TheTechnicalTraders.com to read all of our recent research posts and see what we believe will be the big movers in 2019.